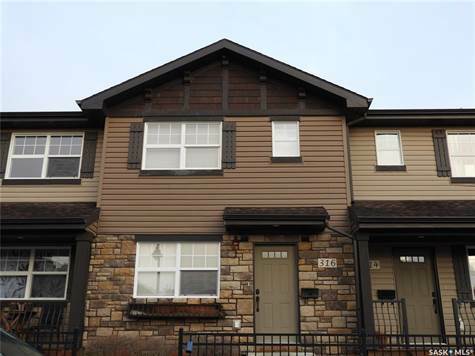 Excellent Fully Developed Two Storey Townhouse in Little Tuscany!\r\nThis North Prairie built unit is located in a gated townhome community in Stonebridge and features 1200 sq ft with three bedrooms and three bathrooms. A bright open concept with a spacious living room, the kitchen with lots of rich dark cabinetry, an island with eating bar and large dining room. Beautiful upgraded hardwood flooring throughout the main floor. Three spacious bedrooms and a full bathroom on the upper level including the master bedroom with a walk-in closet. The lower level has newer basement development that includes a family room, den, bathroom, laundry and storage area. Newer central air conditioning and central vacuum. This townhouse allows for street parking right out front plus two electrified parking stalls and patio area right off the back door. A well-maintained complex offering a Clubhouse with an exercise room, fireside wine bar social room, sports court and visitor parking. All appliances are included and pets are allowed! Great location, close to parks, lake, walking trails and excellent access to downtown, U of S, shopping and all conveniences!